This course is virtually identical to the group Basic RiderCourse, except that it is for one student. Tuition is $950. This course offers 15+ hours of online classroom and riding instruction based on the Motorcycle Safety Foundation (MSF) curriculum. This course is specifically designed for the novice/beginner rider. 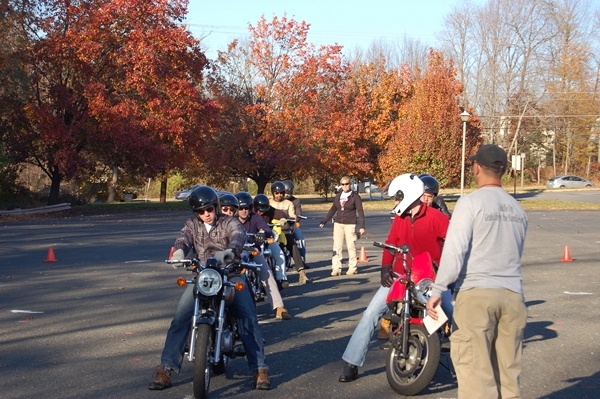 Students learn about components and controls of a motorcycle, riding gear and preparing for the ride. The risk of riding and managing that risk are studied in depth to better prepare the student for "real life" riding. Strategies are investigated that will prepare each student for riding on the street in traffic. Whether you want to learn to ride for pleasure or basic low-cost transportation or both, this course is perfect for you. Take a look at our BRC Highlight Reel to get a feel for the course. Graduating students receive a Motorcycle Safety Foundation completion certificate and a Virginia Class "M2" endorsement (motorcycle license). Here's some more information about obtaining your Class "M2" endorsement in Virginia and Washington, DC. Are you not sure if motorcycle riding is for you? Do you want some advance preparation for the Basic RiderCourse? Then check out our Headstart course. We will schedule the class to fit your availability. If you’re interested in the Individual Basic RiderCourse (IBRC) just let us know. To schedule your class call 703.491.9102 or click here to leave us a message. Note: All IBRC classes must be scheduled during the week when our facility is available.